A complete, portable salon style waxing kit! State-of-the-art USB powered technology ensures your skin can be smooth and hair free wherever you are! The Waxaway Salon Pro Mini Roller Wax Heater offers you the luxury of a professional waxing result anywhere, anytime! With 3 unique roller heads suited for all areas of the body, it’s easy and convenient to achieve results that last up to four weeks! Simply heat, roll and wax! The heater is compact and portable, making it ideal for travelling. State-of-the-art USB powered technology ensures your skin can be smooth and hair-free wherever you are – without having to worry about finding a foreign adaptor. To charge the Salon Wax Mini Roller Wax Heater, you need a 2 amp adapter. Compatible adapters come with iPhone Plus, iPad and all Android Phones. The heater heats your wax to the ideal temperature within 20 minutes and comes with everything you need, including roller heads for waxing the face, delicate areas and larger areas such as legs and body. 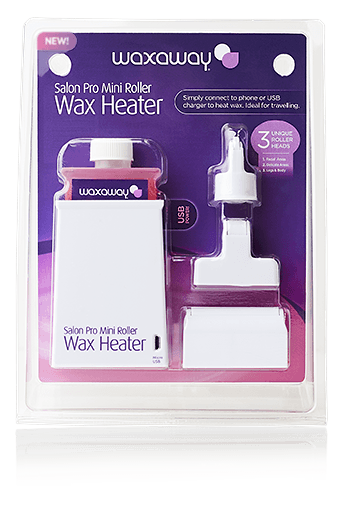 The Waxaway Salon Pro Mini Roller Wax Heater is suitable to use with two Strip Wax Refill Cartridges. Crème Berry Twist Sensitive Skin Refill actively reduces redness and irritation whilst Shimmer Sweet Rosie Coarse Hair Refill removes stubborn and short hair. Apply the wax by rolling the Salon Pro Mini Roller Wax Heater onto the skin. Apply a Salon Pro Wax Strip onto the wax and press firmly. Grip onto the edge of the strip and pull back in the opposite direction to hair growth with one quick movement, as close to the skin as possible. This gentle and flexible wax glides onto the skin smoothly, making it perfect for waxing all skin types. Ideal for use on larger areas of the body such as the arms and legs, it removes short and stubborn hairs quickly and effectively. A rose scented delight with a shimmery appearance, the formula ensures a smooth, salon quality finish every time. With a unique no-leak design, the larger surface area of the roller head allows for a smooth, thin wax application making treatments faster. Based on Australia’s most popular salon professional formula, Crème Berry Twist is a hypoallergenic wax containing Titanium Dioxide to actively reduce skin redness and irritation. With a delicious blueberry aroma, it is perfect for waxing sensitive as well as mature skin. This strip wax is highly flexible, easy to use and removes both fine and coarse hairs effectively.